Huw’s company, Huge Ideaz, provides IT consultancy service to the telecommunications sector. Huw returned to the UK after an extended period abroad and needed to start trading promptly for the start of his first contract. Having decided to turn to contracting I looked at various options for structuring my finances, including using the services of an umbrella company and setting up my own limited company. I knew that running a limited company would be more tax-efficient plus it was better suited for my future projects. However I was extremely concerned about the complexities involved in running a limited company. In addition, I’d already landed my first contract: I needed a quick solution. I contacted inniAccounts and they soon put my mind at ease. They showed me how their software makes it easy to run a business and assured me that my new company would be ready in time for the start of my contract. I decided to go ahead and join. They created and registered my business and I was trading within a few hours – it couldn’t have been easier to get started! 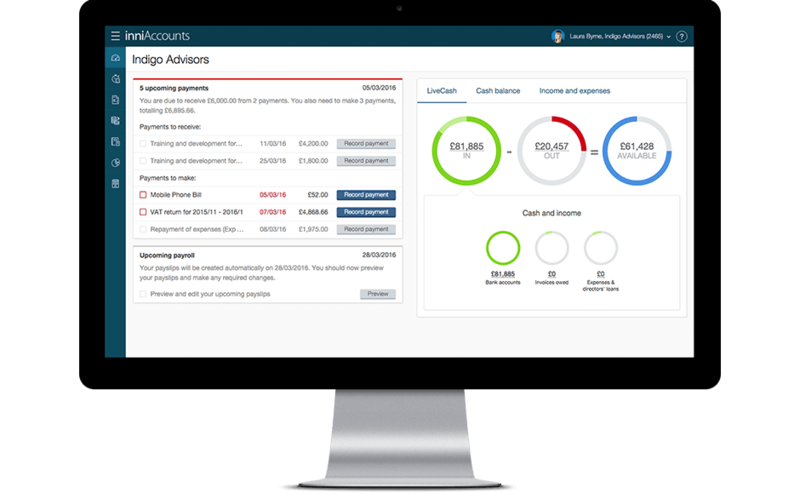 I’ve been using inniAccounts for some time now and I’m impressed with how easy it is to run the finances of my business without losing any sense of control. I feel like I’m always on top of my numbers, which as a first-time company owner is a reassuring feeling. In addition the support that I receive is fantastic – whenever I have a problem that needs sorting out the team are always able to quickly give a helping hand, either pointing me in the right direction or providing specialist help. Overall I’m impressed that the complications and unknowns of running a small business were removed by using inniAccounts. I would definitely recommend inniAccounts – it’s a really efficient accounting service at the right price. I think it’s perfect for anyone running a small services business.